The Williamsport Crosscutters 13th Annual Hot Stove Banquet will be held on Wednesday, January 16 in the Grand Ballroom of the Genetti Hotel in Williamsport. The event is presented in part by Panda Patriot Power, River Valley Transit, WRAK 1400AM, and the Williamsport Sun-Gazette. A portion of the proceeds from this year's event will be donated to the local chapter of the National Alliance on Mental Illness (NAMI). 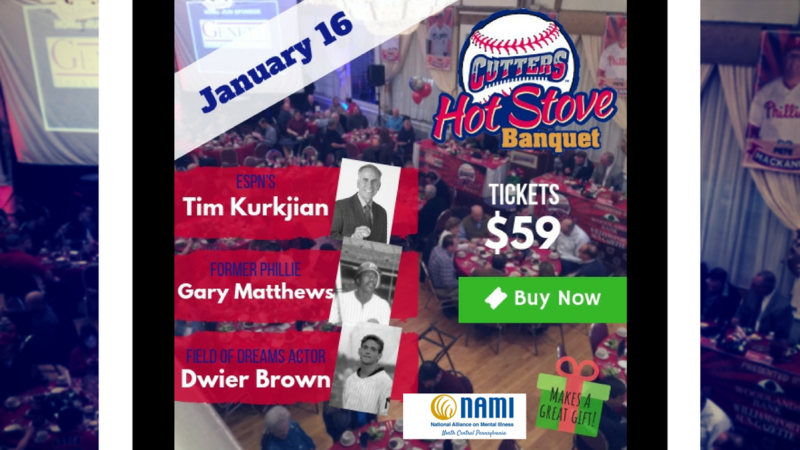 "The National Alliance on Mental Illness (NAMI) of North Central PA is very excited and honored to be selected as the beneficiary of the Hot Stove Banquet charity funds," stated NAMI chairperson Carol Sides. "We will utilize the donation towards educational opportunities for our community on mental health awareness, suicide prevention and suicide awareness." Guests at this year's event include former Phillies outfielder Gary "Sarge" Matthews, ESPN baseball analyst Tim Kurkjian and from the Academy Award nominated movie "Field of Dreams", actor Dwier Brown. Matthews, a first round draft pick of the San Francisco Giants in 1968, hit .281 in his 16-year major league career with 234 home runs and 978 RBI's. Matthews was the National League Rookie of the Year in 1973 with the San Francisco Giants and the MVP of the National League Championship Series in 1983 with the Phillies. After his playing and coaching career, he was a popular broadcaster for the Phillies from 2007-2013. Kurkjian has covered baseball since 1978 and has been a baseball writer, reporter, analyst and host at ESPN since 1998. He has been a regular on Baseball Tonight and Sportscenter. Kurkjian has been part of ESPN's coverage of the MLB Little League Classic the last two years at Williamsport's BB&T Ballpark. Brown, an actor for 37 years, has appeared in hundreds of films, plays and televisions shows, but it was his role as Kevin Costner's father, John Kinsella, in "Field of Dreams" that changed his life. The evening will consist of a full-course dinner, live and silent auctions of sports memorabilia along with interviews and question and answer segments with the special guests. Additionally, Brown will speak about the making of "Field of Dreams" and the special bond between fathers, sons and the game of baseball. Other highlights of the event include the inductions of the latest members to the Bowman Field Hall of Fame and the Lycoming County Sports Walk. Those inductees are expected to be announced in the coming weeks. The ballroom doors open at 5:30 PM with the dinner and entertainment portion of the event kicking off at 6:30 PM. An autograph session will take place at the close of evening. Tickets are $59 per person and can be purchased by calling the Cutters offices at (570) 326-3389 or ordering online at the link below. This event is a virtual sell-out every year, so fans are encouraged to purchase tickets now. Reserved seating is assigned on a first-come, first-serve basis as tickets are ordered. Business sponsorships for the event are also available.